Kinetis is the most scalable portfolio of low power, mixed-signal ARM Cortex-M4 MCUs in the industry. Phase 1 of the portfolio consists of fve MCU families with over 200 pin-, peripheral- and software-compatible devices. Each family offers excellent performance, memory and feature scalability with common peripherals, memory maps, and packages providing easy migration both within and between families. The K30 MCU family is pin, peripheral and software compatible with the K10 MCU family and adds a flexible low-power segment LCD controller with support for up to 320 segments. Devices start from 64 KB of flash in 64QFN packages extending up to 512 KB in a 144MAPBGA package with a rich suite of analog, communication, timing and control peripherals. Memory and package options for the K30 family. 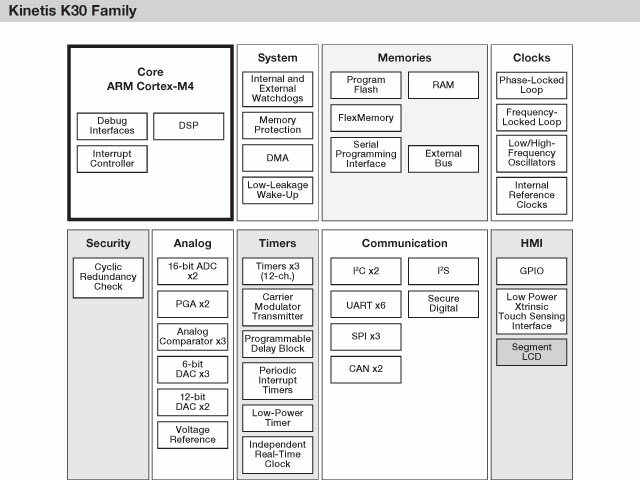 The following table summarizes the memory and package options for the K30 family. All devices which share a common package are pin-for-pin compatible.